Lotus is a water plant native to India with eye-catching blooms and distinctive, bluish-colored leaves. The flowers--available in red, white, pink and yellow--open in the morning and close again in the early part of the afternoon. Lotus plants can grow up to 7 feet tall and are hardy in zones 4 to 10. They are easily propagated by division in early spring or late fall. Place the lotus tuber, which is the bulb-like root, into a container filled with water from the pond where the plant will be growing. Allow it to remain in the water for 14 days. Check the water often and replace if it begins to look cloudy. Remove a small tuber from the main tuber using a sharp knife. Avoid making jagged cuts. Fill a container three-fourths of the way with garden soil. Place the tuber in the soil with the thickest end covered by 2 inches of soil. Make sure the tip of the thinnest part of the tuber is not covered. Put a medium-sized rock on top of the soil, but do not allow it to come into contact with the exposed tip of the tuber. This rock will prevent the new planting from floating away when placed in the water. Place a 1/2- to 1-inch layer of pea gravel on top of the soil and rock. Do not to cover the exposed tip of the tuber. Add 2 inches of water to the container, taking care not to disturb the tuber. Place the plant in a sunny, warm location. Add water as necessary and do not allow the tip of the tuber to become uncovered because it will die if it dries out. Move the container to the pond after three or four leaves have developed. 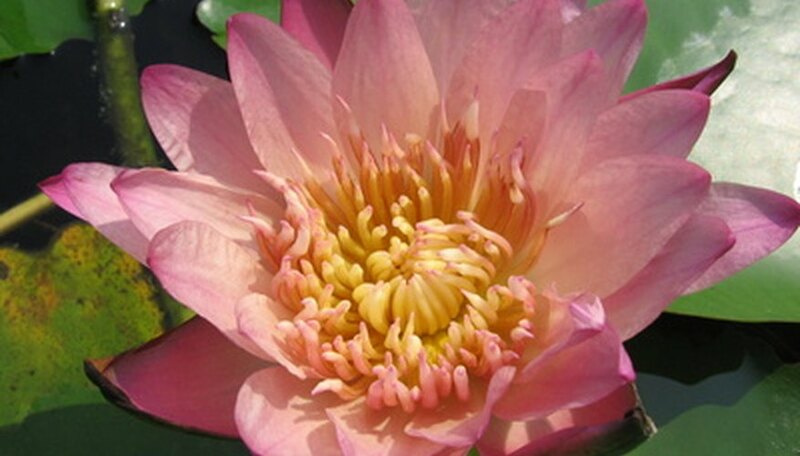 Allow 4 to 6 inches of water to fill the container, depending on the size and variety of lotus you planted. Move the container inside if the nights get chilly before it is time to add the lotus to your water garden or pond. Be cautious when handling lotus tubers, because they are very easy to damage. Do not divide lotus if the plant still has leaves. If the plant is not dormant, it may not survive division. Do not use standard potting soil when planting lotus because it is too light and will float to the top of the water when the pot is submerged.